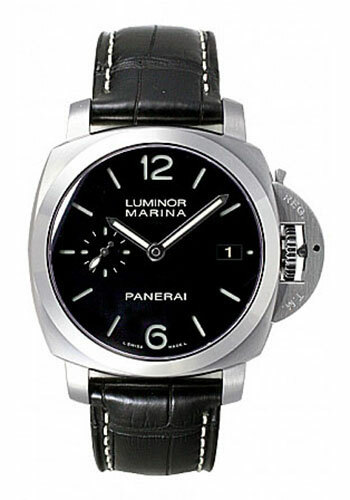 42mm AISI 316L brushed steel case, see-through sapphire crystal back, brushed steel bezel, brushed steel device protecting the crown, black dial with luminous Arabic numerals and hour markers, date at 3 o’clock, seconds at 9 o’clock, automatic Panerai P.9000 calibre movement with hours, minutes, small seconds, date, approximately 3 days of power reserve, black alligator strap. Water resistant to 100 meters. 42 mm brushed AISI 316L stainless steel case, see-through sapphire crystal back, brushed steel device protecting the crown, polished steel bezel, black dial with luminous Arabic numerals and hour markers, date at 3 o'clock, and small seconds at 9 o'clock, P.9010 calibre automatic movement with hours, minutes, small seconds, and date, approximately 3 days of power reserve, black alligator strap with beige stitching. Water resistant to 30 bar. 42 mm polished AISI 316 stainless steel case, see-through sapphire crystal back, brushed steel device protecting the crown, polished steel bezel, white dial with Arabic numerals and luminous dot markers, date at 3 o’clock, and small seconds at 9 o’clock, P.9010 calibre automatic movement with hours, minutes, small seconds, and date, approximately 3 days of power reserve, dark brown calf assolutamente strap with beige stitching. Water resistant to 30 bar.